Camp Pennsylvania: I’m talking with Jessica today. She’s the Park Manager at Black Moshannon State Park in Pennsylvania. Jessica, why don’t you get us started with roughly how long Black Moshannon State Park has been there and give us a little history on the Park? Jessica: Black Mashannon State Park just turned 75 last year. Prior to it being a Park, it was included in the forest area of Mashannon State Forest, but 76 years ago they separated it out and developed the park and started building a bunch of cabins and other recreational. They built the dam and some of the other recreational areas in the Park. Jessica: Lots of our cabins were built by the CCC, so we have lots of old, historic cabins that were built in the ’30s that people can still stay in. CP: All right. It’s amazing how much work was done by the CCC back in the day. I’ve done so many of these interviews and all the time the amount of labor that went into making the Parks great never ceases to amaze me. Jessica: And the quality of labor amazes me as well. That our cabins are still standing – the original logs, some of the original (Unclear 1:07.2), and they’re still in good condition is great. They don’t make buildings like they used to. CP: No, they don’t. Right on your landing page here, you guys have a photo of the cabins, and I mean they look historic. They were very cool looking, and those are the ones you actually can stay in, right? Jessica: Yeah, those are our rustic cabins, and they are called rustic, but inside of them they have electric and a refrigerator, stove, microwave, and an oven. If you stay in those cabins, there’s no running water, so you have to use a shared bathroom facility. In the rustic cabins, there’s no heat. The only source of heat is a wood stove, and we provide wood during the winter, and they’re open through the second week in deer season every year. CP: Oh, very cool. And what other types of camping do you offer there? Jessica: Cabin-wise, we have modern cabins as well that are open all year round that are very popular, and they have electric heat and plumbing on the inside of them. They’re very popular. And we have two new deluxe cottages, which are similar to the rustic cabins, except they have electric heat and no wood stove, and they sleep five people. And then, in the campground, we have about a 80-site campground that has certain sites that allow pets, and then certain electric sites. And hoping next year to add full service hook-up sites that have the full service water and sewer hook-ups. CP: Okay, great. And what are the most popular activities for the guests there? Jessica: The lake is a great lake. It’s a 250-acre lake. It’s a great lake for kayaking and canoeing. It’s pretty small and shallow. Only 20horsepower, or electric motor only is allowed in the water, but it’s a great lake if you love canoeing and kayaking, seeing the wildlife, and the diverse flower species and plant species that we have in the Bog area and in the Park. So it’s great. That’s our most popular activity. We also have a swimming beach that gets heavily used in the summer, and we have a multitude of hiking trails that range from very easy scenic trails. In and around the Park, there’s a 44-mile Alligator Front Trail that has backpacking on it. CP: Okay, that leads me to my next question; is what are some of your favorite attractions in and around that area outside of the Park? Jessica: The Alligator Front Trail is really fun. Outside of the Park, there’s a lot to do in State College. So, a lot of people come and take a trip to State College, whethere it’s go to see the reverie or to go to a football game, or things like that. Also, if you head north of the Park, you’ll head in through the Pennsylvania Wilds, where it’s about a 45-minute ride to the Elk County Visitor Center, which is just a beautiful center they’ve put up and a lot of times you can go and you can see live Pennsylvania elk, so it’s a worthwhile trip. Jessica: We also have some of the local caverns in the area that people like to take trips to. CP: Okay, great. Two more questions for you, Jessica. If you could spend just one hour in Black Moshannon State Park, how would you spend your time there? Jessica: I would go, and I would encourage any other visitors if they are just stopping by the Park for an hour to go to the Bog Trail. It’s a quarter-mile boardwalk that goes over the bog and it overlooks the lake and the bog natural area. Lots of different species and it’s very interpretive, so lots of panels pointing out the picture plants and things like that. So, it’s a quarter mile out and a quarter mile back, but it’s a worthwhile short hike. It’s ADA accessible as well. CP: Oh, it sounds awesome. 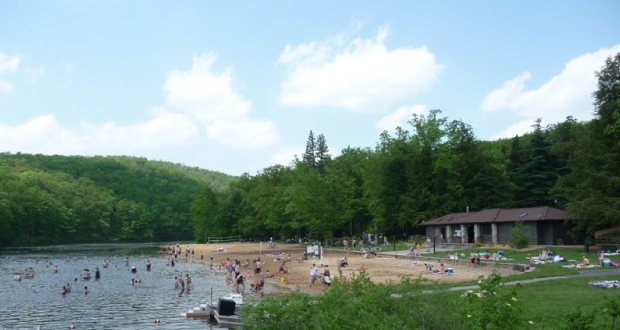 CP: And if you could spend just one night in Black Moshannon State Park, where would you stay for the evening and why? Jessica: Well, we have a great campground. So, if you’ve never been to our campground and you’re into camping, it’s worth coming to the campground. It’s really a woodsy feeling. So, once you get up on top of the mountain, we’re at like a high elevation bog, so once you get up here, you feel like you’re really away from everything. So, it’s really a true getaway. There’s no cellphone reception, so you can truly get away from all the modern-day conveniences, all the headaches from normal life, and really just feel relaxed and rejuvenate yourself. It’s a nice wooded campground that allows you to just get away from everything. CP: Nice. Well, thank you for that tip, Jessica, and thanks for taking some time out of your morning to chat with us today about Black Moshannon State Park in Pennsylvania. Jessica: No problem. Thanks for calling.